Do You Call Them Lollies Or Rosettes? One of the most popular embellishments in all the papercrafting magazines lately are the adorable rosettes/lollies made with a scoring tool. Our Simply Scored Tool makes creating these little gems so easy! The 2 best features of the Stampin' Up! Simply Scored are the 1/8" markings and the small markers that allow you to easily spot where your score line should be. In addition to creating this embellishment, this tool makes creating handmade cards a breeze, too! 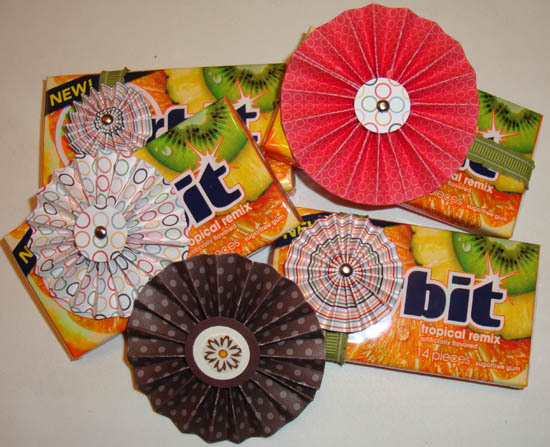 This month I created some of these rosettes in different sizes to sit on top of gum packages that I am giving to all my stamp club members. Here is a "group photo" of my creations! This tool is the perfect start to an online order to participate in my fundraiser for Mothers Against Drug Influences, (M.A.D.I). If you missed all the details, read all about it here! BIG Deal On Big Shot!